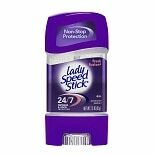 Shop Lady Speed Stick by Mennen 24/ 7 Antiperspirant & Deodorant Fresh Fusion (2.3 oz. )2.3 oz. 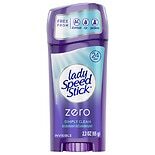 Shop Lady Speed Stick Zero Invisible Deodorant (2.3 oz. )2.3 oz. $319$3 and 19 cents$1.39 / oz. Shop Speed Stick by Mennen Antiperspirant & Deodorant Power Gel Ultimate Sport (3 oz. )3 oz. $279$2 and 79 cents$0.93 / oz. 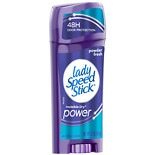 Lady Speed Stick antiperspirant is specifically designed for a woman's physiology and works by reducing perspiration and destroying the bacteria that cause body odor. 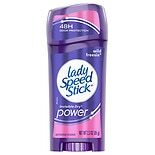 Lady Speed Stick deodorants keep your underarms dry while also providing a clean, fresh scent. Lady Speed Stick comes in a few different varieties, so women have plenty of options to choose from. When choosing a women's antiperspirants, one of the important considerations is the scent. 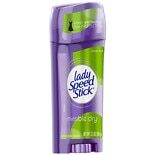 Lady Speed Stick deodorant comes in scents such as freesia, powder fresh, and pear. Some versions offer 24-hour protection, so you can enjoy freedom from underarm wetness and odor all day and night. 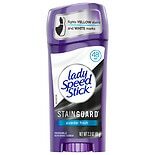 Another option is to choose a Lady Speed Stick antiperspirant with stain defense technology, which helps prevent white stains and yellow residue on your clothing. You can also choose between solid deodorant and gel deodorant. In addition to using Lady Speed Stick antiperspirant, most women also wash their underarms regularly with bar soap or shower gel to help combat body odor and remove sweat and bacteria. Many women choose to shave their underarms, which can also help keep the armpit area clean and dry. If you decide to shave, you should choose a razor and shaving cream designed for women. Another option is to use a waxing kit to remove underarm hair and reduce the likelihood of body odor. 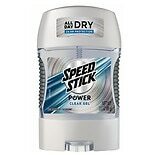 If Lady Speed Stick deodorant is not working for you, you might need to try a clinical-strength antiperspirant instead.